Which Is Better – Defaulting on Credit Cards Or Declaring Bankruptcy? HomeBlog Credit Card DebtWhich Is Better – Defaulting on Credit Cards Or Declaring Bankruptcy? Do you have a huge amount of credit card debt? I’ve read stories of people who had eight or 10 credit cards and managed to run up nearly $100,000 in debt. As you can imagine, that’s a lot of debt to try to pay off. In fact, and here’s a statistic that might shock you, but if you had $20,000 in credit card debt and wanted to pay $200 monthly this would be less than the interest you owed and you would literally never get out of debt. There is a definite downside to filing for bankruptcy. Most people choose a chapter 7 or “liquidation” bankruptcy. It’s biggest negative is it will lower your credit score, probably by 200 points, which will make it very difficult for you to get new credit. This will also negatively affect the cost of your automobile insurance and the interest you pay on any new credit you could get. Plus, a bankruptcy will stay on your credit report for seven to 10 years, depending on the credit-reporting bureau. The credit bureau Experian reports bankruptcies for 10 years while TransUnion and Equifax keep bankruptcies in their records for just seven years. 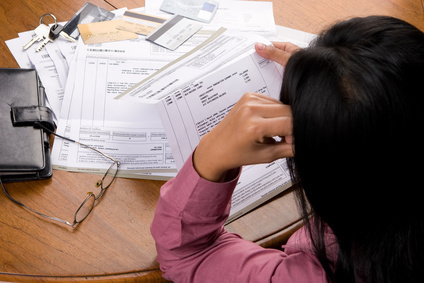 The biggest plus of a bankruptcy is that it will dismiss most of your unsecured debts. This means it will eliminate all your credit card debts, medical bills, and personal loans. The idea behind a chapter 7 is to give you a “fresh start”. If you have a lot of unsecured debts, it will do just that. You can’t just walk away from credit card debt in the sense that those debts won’t just go away. You might stop making payments on your cards but your obligation doesn’t stop. Credit card companies can garnish your wages up to a maximum of 25% of your paycheck. If you don’t owe very much, that might not be a big deal. However, if you tend to live from paycheck to paycheck, this might not be a great solution. I mean, just imagine how your life would be if you had to get by on 25% less than usual. In addition, the credit card company or collection agency could get a judgment against you and attach your assets. This would include any property you own. If you would want to refinance or sell your home, those judgments would have to be satisfied, which could definitely screw up your financing and even prevent you from selling your house. Whether you decide to file for bankruptcy or default on your credit card debt is a decision that only you can make. However, if you owe $15,000, $20,000 or even more in credit card debt, bankruptcy could be a better option. You could spend as little as $500 and have all that credit card debt dismissed in six months or less. This would give you a fresh start, which could be much better in the long run than having your wages garnished or a lien put on your home.